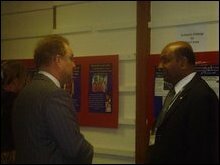 The British Tamils photo exhibition staged with the professed aim of informing the second-generation of Tamils in the UK about the past six decades of 'oppression, ethnic cleansing and discrimination that the Tamil community has faced at the hands of the sovereign state of Sri Lanka' was staged near the British parliament. The exhibition highlighted the destruction and suffering of the post-independence anti-Tamil riots, the state's crushing of Tamil democratic protests, the outlawing of democratic articulation of independence, the destruction of Tamil homes, places of worship and cultural icons, like the Jaffna library. The all day event at the Methodist Central Hall in Westminster drew curious visitors from the British public as well as several MPs, including Joan Ryan MP (North Enfield), Jeremy Corbyn MP (Islington North) and Robert Evans MEP (London), organisers said. “Over a thousand visitors from various communities walked patiently viewing the photos that were explained by volunteers,” the BTF statement said. However the venue had pointed out that British security forces had not objected to the Tamil event, sources said. 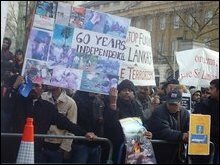 Meanwhile, hundreds of Tamils protested outside the British Prime Minister’s residence, 10 Downing Street. Chanting slogans and holding banners protesting Sri Lanka’s “state terror” and “60 years of Oppression”, the protestors handed out leaflets to the passing public. “Whilst Sri Lanka celebrates independence, hundreds of thousands of our people are suffering in the Northeast at the hands of this state,” a TYO representative told media. The event, from 11am to 3pm was organised by the Tamil Youth Organisation (UK). 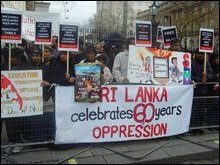 A memorandum appealing to Britain to act to end the Sri Lankan state’s oppression was handed over to the authorities during the demonstration, TYO (UK) representatives said. The protestors were entertained by a street drama with actors parodying the statements of Sri Lanka’s militarist President, Mahinda Rajapakse.